INDIANAPOLIS – One way to know you’re picking up political traction is when opposing partisans begin to take notice; when you are no longer ignored. That is the prelude to 2 p.m. Palm Sunday when one of the most unlikely presidential campaigns kicks off in South Bend. That’s when Mayor Pete Buttigieg officially joins some 20 Democrats seeking to take on President Trump and Vice President Pence. Buttigieg is now showing up, sometimes in double digits, in state and national polls. In several surveys he trails only septuagenarian front runners Joe Biden and Bernie Sanders. He’s been a piping hot commodity on the cable and network talking head circuit. Last Sunday on NBC's Meet The Press and at the LGBT Victory Fund brunch less than an hour later, Buttigieg got the attention of Republicans. In discussing his sexuality, Buttigieg told the Victory Fund, “It’s hard to face the truth that there were times in my life when, if you had shown me exactly what it was inside me that made me gay, I would have cut it out with a knife. If you had offered me a pill to make me straight, I would’ve swallowed it before you had time to give me a sip of water." Hupfer added that it contradicts a long-time Buttigieg call for political "civility." Indiana Republicans issued an "irony alert" on Friday, noting that major renovations to Studebaker Building 84 – which had sat vacant on the southern edge of downtown South Bend since Studebaker ceased production in 1963 and will be the backdrop to Buttigieg's campaign kickoff – were spurred by $3.5 million in state grants from then-Gov. Pence’s Regional Cities Initiative. It's true, when the two were executives in Indiana, they appeared to have a warm working relationship whether it was on economic development projects such as the Studebaker complex, or during the Dyngus Day festivities. During the 2015 Religious Freedom Restoration Act controversy that essentially ended Pence's 2016 presidential aspirations, Buttigieg was relatively quiet and didn't join the thunderous wave of criticism. He did participate in a rally in South Bend during the controversy. He noted in his book "Shortest Way Home", "I wish I could say I made a good effort to talk him out of it, but it was clear from the look in his eyes that he had made up his mind,” he wrote, referring to a meeting AP reported on in which Pence told Buttigieg and other mayors he planned to sign the legislation. New York Magazine's Andrew Sullivan observes, “Trump would be the oldest president in history at 74; Buttigieg would be the youngest at 39. Trump landed in politics via his money and celebrity after years in the limelight; Buttigieg is the mayor of a midsize midwestern town, unknown until a few weeks ago. Trump is a pathological, malevolent narcissist from New York, breaking all sorts of norms. 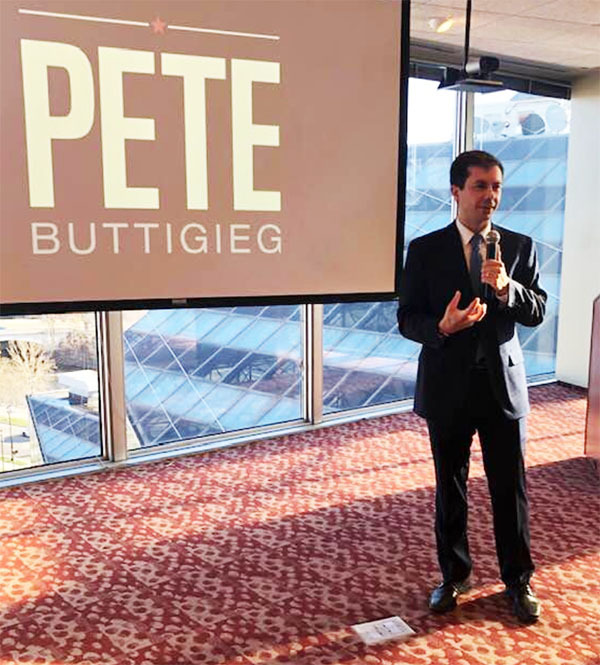 Buttigieg is a modest, reasonable pragmatist, and a near parody of normality. Trump thrives on a retro heterosexual persona; Buttigieg appears to be a rather conservative, married homosexual. Trump is a coward and draft dodger; Buttigieg served his country. Trump does not read; Buttigieg does. Trump’s genius is demonic demagoguery. Buttigieg’s gig is careful reasoning. Trump is a pagan; Buttigieg is a Christian. Trump vandalizes government; Buttigieg nurtures it. So as Mayor Pete declares on Palm Sunday, the battled has already been enjoined.